Your living room should be a reflection of the pride you take in your home. It should be a unique room you love coming home to relax in after a long day. Giving your living room a full makeover doesn’t need to cost you a fortune to achieve a transformation; all it takes is a crafty mind and inspiration. Here are some ideas to shake up the scenery in your living room. If you’ve had the same setup in your living room for years and you’re starting to get bored with it, now is the perfect time to switch up the arrangement of your furniture. A little Feng Shui will do a lot to change the feel of the room. When you’re rearranging, keep in mind that accessibility is key. The more open the room feels, the more inviting it will appear to guests. 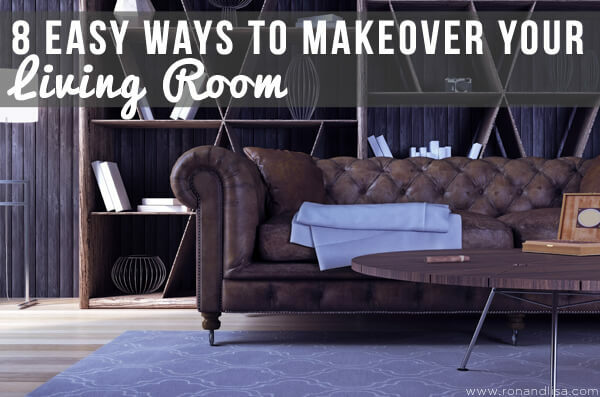 When your living room is starting to feel outdated and in need of a refresh, upgrading your furniture will definitely turn it back into the best room of the house. Keep an eye out and find some of the trendiest new furniture that’s American made and take your family room from stale to spectacular, with an emphasis on comfort. For vegans, organic cotton, burlap and hemp are great choices. For non-vegans, leather is a classic choice, and can match a variety of style schemes while still providing good comfort. Check out a site like LeatherFurniture-USA.com to locate the best leather furniture and learn how to care for your new pieces. Putting a potted tree in the corner or a small plant on the coffee table can do a lot to change the vibe of the room while also adding oxygen. In addition to providing the necessary motivation to flood the room with natural light, plants will lighten the mood by changing up the scenery in your home. Just be sure to keep up with maintenance and dusting so they always look healthy and appealing. You wouldn’t believe how much re-painting with zero or low VOC paints or putting up a new toxic-free wallpaper can transform a room. Revamp your living room with new personality by giving it a new color. Be sure when you recolor your walls to stick to soft, light accents. Creams, whites, and light hues are great to give the room a clean and brighter look to set a warm inviting mood. Turn your walls into a gallery. Shop around for some new, awesome art pieces or keep it thrifty and unique by creating your own prints. This will do wonders to personalize the room while keeping the cost down. Be sure to have a point of focus and get a large piece of artwork to serve as your center piece. This will give your living room a theme and be the first impression when people walk in. Complement the natural lighting spilling into your living room with some new drapes. Use long curtains to add texture and even patterns that start where the wall meets the ceiling to provide a classy, sophisticated look. Updating the drapes will give the room new contrast and help to set the mood. There is no better way to pull a room together than laying down the right rug. A new rug will be the centerpiece of the entire room and delineate the space. Find the perfect natural area rug to highlight the room’s color scheme while infusing texture. Jute, sea grass, sisal, and wool are great choices. Be sure you take all the proper measurements and assess the space you are working with before going shopping. A rug should be sized perfectly to complement everything else in the living room. Now that you have some great ideas of what to put in your living room and how to position it, bring all your hard work to life by selecting the perfect lighting. Combine floor and table lamps to set the right contrast. Look for energy efficient LED lights to reduce energy usage and save money on your bills. Task lighting such as lamps give you the opportunity to really add mood to the space you have. Whether it’s the new art, furniture or color, utilizing the lighting in the proper scale will do wonders to spice up your living room. Remember, the biggest changes in a room can sometimes be the simplest. Your living room should be a point of pride and you should always strive to make it the best it can be. Be resourceful this year by thinking outside the box to rejuvenate your living room.